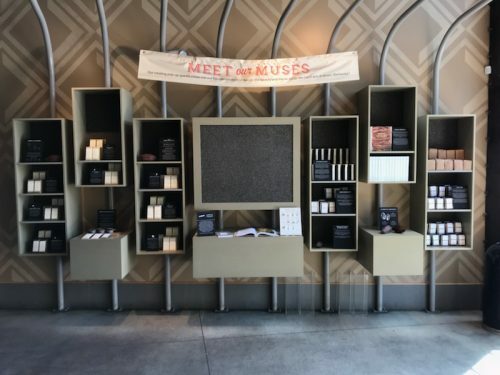 When Salt & Straw ice cream invited Dandelion Chocolate to be the pop-up shop in their Los Angeles-based Arts District DTLA scoop shop (829 E. 3rd St.), we were thrilled and jumped at the opportunity. We could not think of a better way to introduce ourselves to the LA community than inside our favorite ice cream maker’s store. Our pop-up shop inside Salt & Straw’s Arts District DTLA scoop shop. 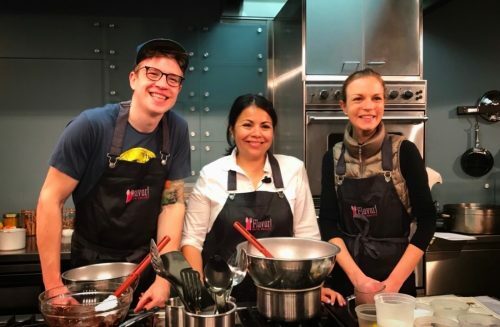 In 2017, Dandelion Chocolate’s Executive Pastry Chef Lisa Vega taught a class with Salt & Straw’s co-founder Tyler Malek at the Culinary Institute of America in Napa. Lisa made her chocolate “Nutella” celebration cake and Tyler made nib-infused ice-cream. Soon after, Tyler and the Dandelion kitchen team collaborated to create the Smoked S’more ice cream flavor for their limited edition chocolate menu. Since then, all of Salt & Straw’s San Francisco scoop shops have served a rotating flavor that includes Dandelion Chocolate. A friendship made in chocolate ice cream heaven! In the LA pop-up shop, we will be offering a curated selection of our bars, hot chocolate mix, cocoa nibs, and ground chocolate, as well as our book, Making Chocolate: From Bean to Bar to S’more. And, of course, visitors will be able to taste samples of our chocolate. Norah, one of our long-time employees who now lives in Los Angeles, helped bring the pop-up to life, and we are so grateful for all of her hard work! The pop-up will run through February 2019 during regular store hours, 11am to 11pm daily. Please stop by and say hello!